here is something i am working on. pen & ink & watercolor. it's 9 x 12 inches. it feels kind of Celtic-y to me but it's not overtly so. 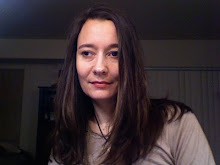 maybe it feels that way to me because i have been looking at celtic art and thinking about it, and i was listening to Charles de Lint's Moonheart while working on it, which features a Celtic bard, among other things. For a long time it was my favorite of his novels. I still like it, but having been recently rereading and re-listening to some of his later works I can appreciate how his talent has matured. I sure hope he is going to do more audio books. (Well, he is not the reader, but I mean I hope he authorizes them!) Forest of the Heart is my current favorite, and it has not been made into an audio book -- at least not yet. Lots of art ideas in my head and not much time to work on them! I have a sinus headache this evening so I think I will now go hole up with a book. 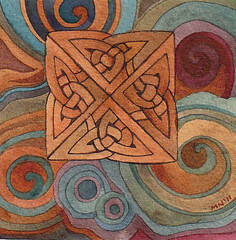 i am working on learning to draw some Celtic knots. It's even harder than it looks! I did this one a couple nights ago. I am even more exciting about the one I worked on last night.. I'll show that to you when I am done. I've started adding a few more to my Etsy shop this week, too. 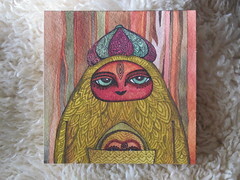 Speaking of Etsy, my friend Kathy made a really cool Treasury List!. Love the GREEN! Tomorrow Kathy and I are going to a tribal belly dancing event at the Seattle Center. That should be fun. I'll probably come away with some more inspiration!! 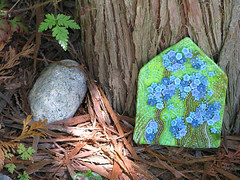 This is a little beaded and quilted piece that I did as part of Robin Atkin's Beaded Journal project. Artists from around the world spent a year creating beaded works to reflect whatever was going on in their lives at the time. I was involved in this project in 2009. It's still ongoing if you want more information--just check Robin's website. 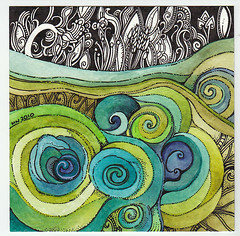 This piece was created in April 2009, in honor of spring. When I was growing up on Vashon Island, there was a little clearing in the woods near our house. There had been a house there at one time, and we found some bits of it- foundation stones buried in earth and grass, a few wooden bits of what had been the outhouse roof, and a few old medicine bottles. The people who had lived there, who knows how many years back, had planted bluebells, and over the years the bluebells took over the clearing and started spreading into parts of the woods where there was a bit of sunlight. Every spring there would be thousands of them. My sister and I used to go and pick them. So bluebells always make me think of Spring. photo by audin malmin, angry viking llc. If you are of a mind to, you can visit a new page on my website. i made a page of my sketch journal's progress and will be updating it. have you noticed i've been adding new content to my website over the last month? exciting news if you are a hedgehog. another new painting. 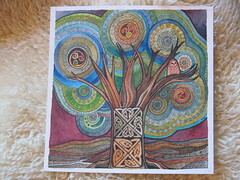 i am working on ideas for a new series of works inspired by celtic design - mostly the neolithic stone carving. i don't really know where the idea is going - this is not what i had envisioned, but then what i had envisioned is rather vague. maybe more a feeling than anything else. and darn, knot work is intricate! it's hard enough to draw with pencil, eraser, and ink pens - imagine doing it with the basic tools available to contemporary carvers! my mother and i went to a show of knitting inspired by viking carvings. i don't think i really understood, till then, what the intricate cable work seen in scandinavian knitting was really trying to represent. it gave me a new appreciation. viking carvings are similar to the celtic ones, but of course viking ships "visited" (or raided) the west coast of England many times over the centuries. we'll see where these new ideas of mine end up going. 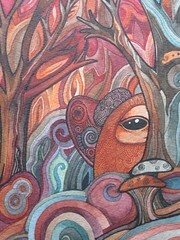 here is a new little painting i did yesterday. yetis are elusive but i have a way with them. they like tea and biscuits, and are really quite civil creatures if you offer them a thermos of earl gray or english breakfast tea, preferably with cream and sugar, no lemon. 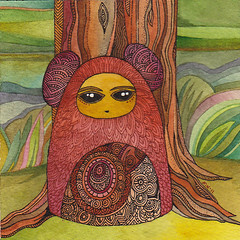 in other news i've started listing some of my newer forest creatures on etsy. 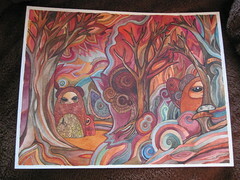 and i made an etsy treasury list, This Sublime Earth". the colors are more vibrant in person. i don't think this will fit on my scanner so i can scan it. maybe i'll try to take another picture later when the sun is shining in my west-facing windows. I don't have much else to say because I am not feeing well. a coworker forwarded me this great link.. a Wind Powered Knitting Machine. now the knitting in this picture is not machine knitting, it is hand knitting, a closeup of part of the Leaf Light Kimono I made from a Jane Thornley Pattern. 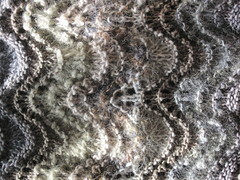 It is the windiest knitting I have .. reminds me of ripples of clouds or water rippled by the wind, sand rippled by the sea. more trees, and some critters. 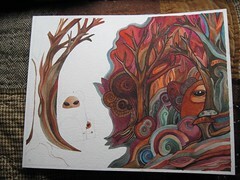 it will be 11 x 14" when it is done - watercolor and ink on arches watercolor paper. this is about as much as i pencil in- if anything. most of it is pretty much a free-for-all. i keep coming back to autumn colors because that's how i am. 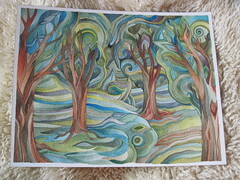 I've been painting this all week - trees! 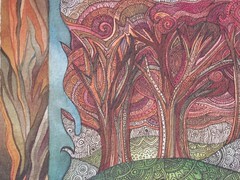 and that inspired me to create this tree-inspired treasury list: Oh such Glories Trees!. enjoy! remember to "Spring Forward" if you are in a place in the US that observes daylight savings time. I can't say I am a fan of monkeying about with time. so one of the things i get to do at my "real job" is take care of a collection of trade blankets. these were produced by Pendleton and other mills, starting from the late 1800s to the present. Pendleton is the only mill currently still making them, and the only mill to make it past the 2nd world war. These were originally made to trade to Native Americans, and you will hear people calling them Indian blankets, but they were not actually made by Native Americas. 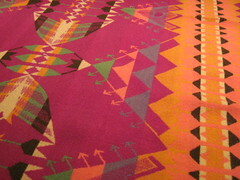 Some of the designs were inspired by Native American textiles, though. This one has a Teepee motif. This is kind of an unusual color combination so I rather like this one. It does not have a label so I am not sure which mill it was made by. this is something i am working on. 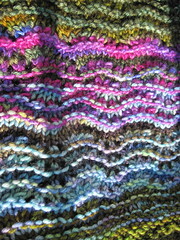 i love playing with color and texture - it's like painting with yarn! i am thinking of writing some little tutorials for a couple of very simple projects employing this sort of free-form knitting where you frequently switch yarns and combine things that might not OBVIOUSLY go together. is that something you might find of interest? it would be geared towards any skill level. anyway, if you are intersested my twitter ID is megannoel. Also if you have something really REWARDING you do with your twitter account or if you have found a twitter account that really inspires you, let me know! i find it is an ongoing process to use the amazing opportunities on the internet to enrich life and not to reduce it to a surface level! it can be done - who is with me? as part of my continuing effort to add more current and recent work to my website, i have added another new page, dedicated to Spirits of Autumn. 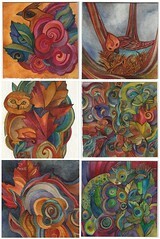 I've added 22 small paintings done in the Autumn of 2010, featuring for the most part spirits of the air - birds, feathers, and falling leaves. Along with a few other spirits who wanted in on the Autumn palette - koi and bison, who i assume are spirits of the water and air. Anyway, enjoy seeing them all together in one place! in my head, it's all connected. 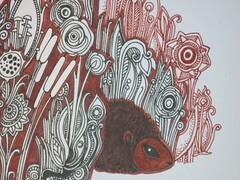 my paintings, my drawings, my knitting, my beading, all of it. i have not figured out of my much-neglected music is connected to all of the rest of it, but i suspect it is and that someday i will have the leisure to sort that connection out. it's a gorgeous day out! it's amazing that i got to walk and sit in the sun two days in a row! i really think i should move south one day. i don't want to leave my family, though. maybe they should come with me? i am getting over a cold. not much fun but it is the season, at least in the northern hemisphere. i am glad it is the weekend- almost! 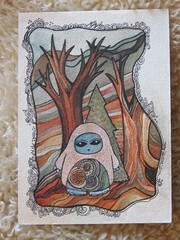 this is a little creature i painted before the virus started dragging me down! i am rather fond of her hair. at least i think it is hair. it could also be ears. it's hard to say with this kind of creature and it seems so rude to ask. i am sort of in love with this little guy. the colors, the textures, all of it. he looks like someone i would like to know. do you know snuffkin? i think he is freinds with snuffkin. i painted a little friend for him last night, but i have not scanned her yet. check back later today or tomorrow and you can see her. i really would like to have a show w/ a bunch of these little guys. 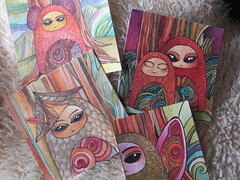 the ones i am working on now are 5 x 5". there is soemthing rather satifsying and complete about things that are small and square. 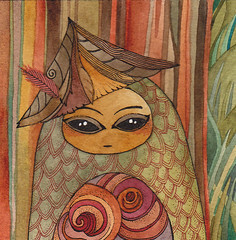 i was painting minarets but i switched over to the forest creature series over the weekend. I can do different things but I have to block out time for them. 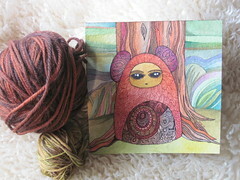 So when I am painting a lot I probably will not be drawing, or when I am knitting a lot I won't paint. I can seem to keep 2 things going at once if I don't have much else going on in my life (other than the 9 to 5 job naturally) but not more than 2, and it's actually better if they are two not-very-alike things rather than 2 similar things. And I usually block the periods out over months, not days or weeks. I have to have a stretch of focused time or I never get really submerged into what I am working on. Well, anyway, I suppose that is enough on how my creative brain works. 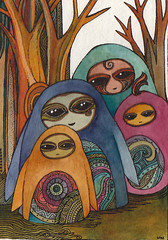 In case you are interested, I did list a few of my monsters on etsy.